For investors, it can be easy to feel overwhelmed by the relentless stream of information in the media. Let’s face it, there’s a lot of noise out there, and when talking head on TV are shouting non-stop, it can be easy to lose sight of your long-term investment goals. Here are just a few Headlines from the ”lost decade” that may have presented a challenge to investor’s discipline. For many, reading these headlines may have invoked strong emotions, and may have pushed some to make fear or greed based changes in their portfolio. Headlines with emotional resonance can have the power to move people to action. In fact, at times, the pull to take action can be so strong that it feels almost physical! At times like that, doing nothing is a very difficult thing to do. But, what if an investor had resisted the pull of the headlines and, well, done nothing? 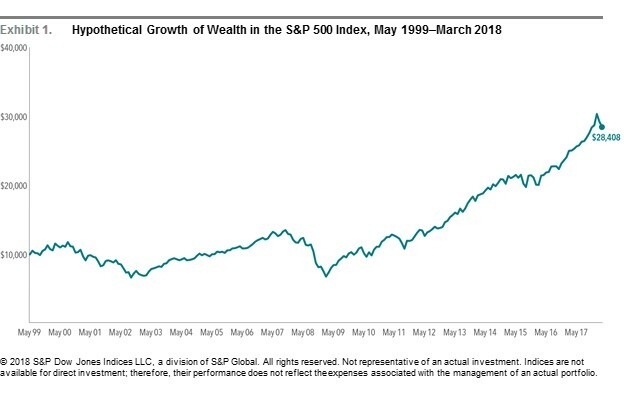 If an investor had hypothetically invested $10,000 in US stocks in May 1999 and just stayed invested – through all the ups and downs, through the mania of the Internet Bubble, and the panic of the Financial Crisis – that investment would be worth approximately $28,000 in March, 2018. Part of being able to avoid giving in to emotion during periods of uncertainty is having the appropriate asset allocation for your particular situation. Our approach to asset allocation is based on the Core4, and we believe this approach let’s us design an allocation that will fit both your objectives and your risk tolerance. But that’s not enough: No matter how well designed our investment strategy is, no matter how well thought out the plan is, if emotions get the better of us, we probably won’t be able to stick to it. Our view at Oak Harvest is that it’s just as important to deal with what’s happening between our ears as it is dealing with what’s happening in the markets. We find that, just as with many aspects of life, many investors can use a little help in staying on track over the long-term. After all, the best athletes in the world work closely with a coach to increase their odds of winning, and many successful professionals rely on the assistance of a mentor or career coach to help them manage the obstacles that arise during a career. Why? They understand that the wisdom of an experienced professional, combined with the discipline to forge ahead during challenging times, can keep them on the right track. This is the role that we aim to play for our investment clients. The investment team at Oak Harvest focuses on being both an objective voice, dedicated to your goals…as well as a pair of open ears. Even as we argue that ignoring the noise gives investors better odds of achieving their investment goals, we recognize that the emotions triggered by financial or market uncertainty can be very real. That’s why we are always willing and pleased to talk when our clients have questions, or even simply listen when you have something to talk about. We willingly provide our perspective, encouragement, and open ears to keep you focused on your destination. Our prime directive is to help you achieve your investment goals, so that you may better achieve your vision – perhaps to enjoy a more stress-free retirement, leave a legacy, or make a positive impact in society. A recent survey conducted by Dimensional Fund Advisors found that, along with progress towards their goals, investors place a high value on the sense of security they receive from their relationship with a financial advisor. The investment team at Oak Harvest is committed to building strong relationships with our clients. We believe that we may be able to help you be better prepared to live your life through the ups and downs of the market. That’s the value of discipline, perspective, and calm. That’s the difference we focus on providing. Data provided by: Dimensional Fund Advisors LP. Views and opinions are subject to change. Data cited is believed to be reliable but is not guaranteed. This article is distributed for informational purposes, and it is not to be construed as an offer, solicitation, recommendation, or endorsement of any particular security, products, or services. Investors should talk to their financial advisor prior to making any investment decision.